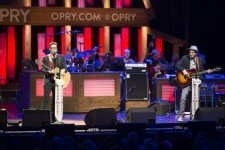 Nashville, TN – March 29, 2016 – Bobby Bones And The Raging Idiots’, the musical comedy group comprised of Bobby Bones and Producer Eddie from iHeartMedia’s The Bobby Bones Show, first full-length album, THE CRITICS GIVE IT 5 STARS is the No. one comedy album and in the Top 5 of Billboard’s Country Album Chart. In an overwhelming release week for the duo, following the album’s release on March 18, they headed across the country to meet fans for a series of CD signings that saw fans in their thousands show up to meet and celebrate release of the comedy album with the pair. Produced by Nick Autry and Bobby Bones THE CRITICS GIVE IT 5 STARS is proving to live up to its tongue-in-cheek title as Sounds Like Nashville raves that “for those in need of a mid-day pick-me-up the album more than succeeds…Bones’ ability as a songwriter is undeniable.” “Packed with collaborations with A-list country stars” (Billboard) the group’s superstar friends Kelsea Ballerini, Lindsay Ell, Charles Kelley, Brad Paisley, Carrie Underwood and more are featured on the 13 song, side-splitting disc that takes satirical and deliberate cues from today’s popular music. Bobby Bones, who recently garnered his second ACM award for “National On-Air Personality of the Year” and is best known as “country’s biggest radio star,” (CBS News) has proven to be one of the genre’s most influential tastemakers , breaking some of country music’s freshest talent. The host of iHeartMedia’s The Bobby Bones Show reaches 4.8 million weekly listeners on nearly 100 stations. For additional tour dates and information on Bobby Bones And The Raging Idiots, please visit www.ragingidiots.com or follow Bobby Bones, Producer Eddie and The Raging Idiots on Twitter. Find the most current Bobby Bones tour dates from our partners at Country Music On Tour, your trusted country concert ticket source! Country Music News Blog participates in advertising programs that help fund the operation of this site. For more information please visit our privacy statement. This entry was posted in Bobby Bones, Press Releases by admin. Bookmark the permalink.